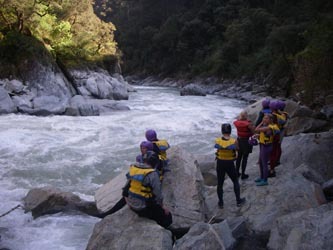 Benefits of rafting the North Fork American River with a commercial rafting outfitter include the fact that they take care of details like permits, shuttles, and food. Boaters with their own gear and have the proper level of expertise however, can run a private trip on the North Fork; with some planning and appropriate gear, the logistics aren’t terribly complex. 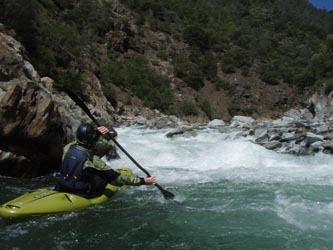 This information will help you plan a private trip on the North Fork American River. Permits are not required to do a private trip on the North Fork of the American River, but if you want to camp in the canyon, you need a wilderness camping permit from State Parks. Call (916) 988-0205 for more info about getting wilderness permits. If you want to do a two-day river trip on the North Fork you’ll need a wilderness camping permit, but very few people do overnight trips on the Chamberlain Falls run. Most people who want to do an overnight do the upstream runs of Giant Gap or Generation Gap. For more information on camping near the North Fork of the American River see the Places to Stay page. Some boaters combine a Chamberlain Falls run with a Giant Gap (upper section) run. Or, you can “do laps” on Chamberlain’s and get in a couple runs. Because the North Fork is free-flowing, you never have to worry about water releases. There is no organized shuttle program on the North Fork of the American so you’ll have to shuttle your own vehicles. The North Fork American River is located near Colfax, California, off the Hwy 80 corridor. Exit I-80 at Colfax. Take a right on the freeway frontage road (west) until you reach Colfax-Iowa Hill Road. Turn left. The put-in is about 3 miles down, past the Maidu Cemetary on the left. Drive carefully! Colfax-Iowa Hill Road is verrrrrry twisty and turny. They are now charging $5 to park on the south side of the bridge, but you can park on the side of the road just before you reach the bridge. To get to put-in you go through the campground. You have two options for taking out on the North Fork. For a full-day trip that takes out at Ponderosa Way (this is what most commercial companies use) you’ll want to get off I-80 at Weimar Cross Rd and leave your car at the Park n’ Ride lot. Most private boaters take out at Yankee Jim Rd/Shirtail Canyon Bridge (this avoids a few miles of class II water below the bridge). Exit I-80 at Weimar Cross Rd and follow Canyon Way toward Colfax. Turn right onto Yankee Jim Road and leave your car at the bridge that goes over Shirtail creek. Pay special attention to the parking signs–they tend to change frequently!